Vatican City, Nov 30, 2013 / 03:20 pm (CNA/EWTN News).- Pope Francis sent special greetings to the Archbishop of Constantinople today, expressing his desire for continued dialogue between the Catholic and Orthodox Churches. “You Holiness, beloved brother in Christ, this is the first time that I address you on the occasion of the feast of the Apostle Andrew, the first-called. I take this opportunity to assure you of my intention to pursue fraternal relations between the Church of Rome and the Ecumenical Patriarchate,” he wrote on Nov. 30 in the message delivered by Cardinal Kurt Koch, president of the Pontifical Council for Promoting Christian Unity. Cardinal Koch had led a delegation from the Holy See to Istanbul for the feast of St. Andrew. After taking part in a Liturgy presided over by Patriarch Bartholomew I, the Ecumenical Patriarch of the Eastern Orthodox Church, Cardinal Koch delivered Pope Francis’ message. “It is for me a source of great reassurance to reflect on the depth and the authenticity of our existing bonds, the fruit of a grace-filled journey along which the Lord has guided our Churches since the historic encounter in Jerusalem between Pope Paul VI and Patriarch Athenagoras,” the Pope’s message said, referencing the momentous event of 1965 in which the leaders of the two churches lifted the excommunications that had been placed on each other in 1054. Pope Francis also took time to consider the difficulties faced by Christians in the East who are persecuted for their faith. “The memory of the martyrdom of the apostle Saint Andrew also makes us think of the many Christians of all the Churches and Ecclesial Communities who in many parts of the world experience discrimination and at times pay with their own blood the price of their profession of faith,” he reflected. Earlier on Saturday, Pope Francis had met with pilgrims from the Greek Melkite Catholic Church, expressing similar concern for Middle Eastern Christians who face serious persecution. “My thoughts go immediately to our brothers and sisters in Syria, who have been suffering a ‘great tribulation’ for a long time; I pray for the many who have lost their lives and for their loved ones,” he said to those gathered in the Vatican’s Clementine Hall. 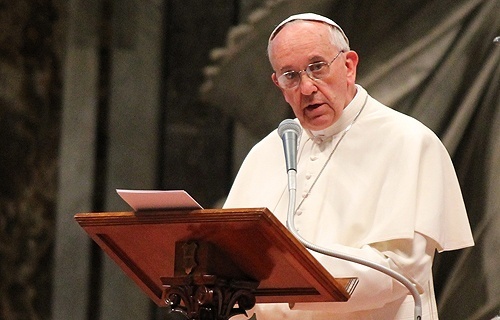 “We believe firmly in the strength of prayer and reconciliation,” emphasized Pope Francis. Those Eastern Christians who remain in communion with the Catholic Church, such as those of the Melkite tradition, are a “visible sign to all of our Eastern brethren of the desired communion with the Successor of Peter,” he added.